Finally, IPL 2019 is here. Auction for IPL 2019 is done now. All teams have finalized their squad. 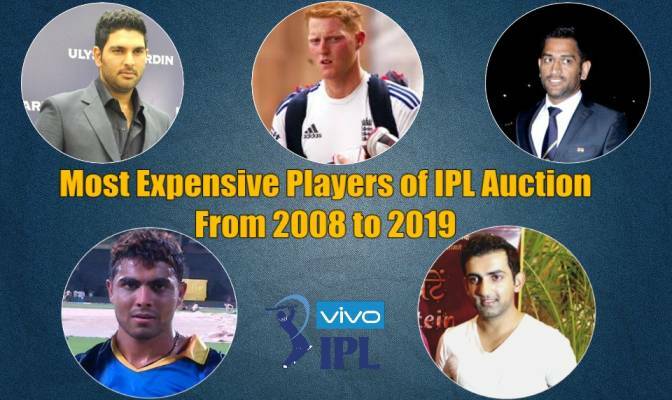 We witnessed some surprising biddings in IPL 2019 Auction. Here we will talk about the list of Most expensive players in all seasons of IPL. In this list, I have included the most expensive players in all seasons, some of them does not play anymore. We will check who was the most expensive player in every season of IPL till now. So check below the most expensive player's list in all seasons one by one. Mahendra Singh Dhoni was the most loves and a good batsman at that time. No doubt he is still the most loved captain. In IPL 2008, MSD was Most expensive player of IPL. He was bought by Chennai Super Kings. after getting 9.2cr from CSK he was the Most Expensive Player of IPL 2008. When Mahendra Singh Dhoni joined the CSK, he made them champions. Chennai Super Kings became a good team after he joined them. He was bought for ten crores by Chennai Super Kings again. So that means in the first two seasons, Chennai Super Kings bided the highest amount of money. So in the second season of IPL, CSK bought again one of the Most Expensive Players of IPL. IPL 2010 did not have a mega-auction. Most of the teams retained their players. But there were two players who got sold for the price of 5 crores. So the two were Most Expensive Players of IPL 2010. These two players were Shane Bond and Kieron Pollard. Shane Bond was bought Kolkata Knight Riders and Kieron Pollard was bought by Mumbai Indians. Buying Pollard was a big and clever move by Mumbai Indians. In 2011, there was a mega auction held. and the format was also changed for the game. Before 2011 there was a rule that players of Delhi will play for Delhi Daredevils only. Like that only a player from Punjab will play for KXIP. But many players were shuffled after the Auction of IPL 2011 and started playing for other state franchise. Gambhir was the Most Expensive Player of IPL2011. Kolkata Knight Riders added Gautam Gambhir in their team for 11.5 cr. The 5th season of IPL was very good for Ravindra Jadeja. Chennai Super Kings bought him for 9.2 crores, which proves to be a good decision for the CSK team and their fans. Jadeja did well as Most Expensive Player of IPL 2012. Mumbai Indians were also bidding on Ravindra Jadeja but CSK won the bidding war and CSK added him to their team after paying 9.2 cr. Glenn Maxwell was the most expensive player in IPL season 6. Maxwell was in good form at that time and he was being compared to David Warner. Mumbai Indian bought him for 6.5 crores. Yuvraj Singh was in form at that time and RCB bought him due to Virat Kohli's suggestion. So he was added to the team RCB for a big amount of 14.5 cr. It was the highest bid in Auction for any player till that time. But Yuvraj Singh failed to fulfill the expectations of team and fans. So last year Yuvraj was bought by RCB for a big amount but he did not perform well in that season of IPL so RCB decided to release him. Once again he was in the Auction and this year Delhi Daredevils shown trust in him and bought him for an even bigger amount of 16 crores, which was again highest till date. Once again Yuvraj became the Most Expensive Player of IPL 2015. In the season 9 of IPL, two teams Rajasthan Royals and Chennai Super Kings were banned so two new teams were formed Gujrat Lions and Rising Pune Supergiants. RPS bought Mahendra Singh Dhoni for 12.5 cr and though he was the Most Expensive Player of IPL 2016. This was not a good season for MSD. It's been 10 years to IPL and England's all-rounder Ben Stokes came in the Auction for the first time. Ans he became the highest paid player in that season after RPS bought him for 14.5 cr. Ben Stokes was the Most Expensive Player of IPL 2017. Talking about the previous year's season which was IPL 11, once again Ben Stokes became the highest paid player in the auction. Last year Ben Stokes was bought by Rajasthan Royals in 12.5 cr. Once again Ben Stokes was the Most Expensive Player of IPL 2018. Well, we all know the surprising biddings of this year, the first name in highest bidding of this year was were Jaidev Unadkat from RR. Rajasthan Royals bought him last year also in a big amount as the highest paIndianian player in IPL 2018 Auction, but they released him this year and again bought him for 8.4 cr. Other name is a shocking and new name which is an uncapped Indian all-rounder Varun Chakravarthy. Varun in an all-rounder player and bought by KXIP in 8.4 cr. So this is the list of Most Expensive Players of IPL in all Seasons. I have told only the names of the players who went to the auction. Do you think buying Varun Chakravarthy for 8.4 cr is a good move by KXIP?